It’s over 60 years since the U.S. military mopped up the debris found on a ranch in the Middle of Nowhere, New Mexico. The patch of desert in question was 75 miles north of the town of Roswell. The rancher who owned the land, Mac Brazel, found the debris strewn across the desert floor, fanning out from a point of impact. He didn’t recognize the material as anything he’d come across before, although weather balloons had crashed on his land on previous occasions. He heard stories of ‘flying saucer’ sightings from the townsfolk nearby, and wondered whether this strange debris might be related. He called in the local military people, and Major Jesse Marcel was sent out to his ranch to check the story out. Marcel was an intelligence officer for the 509th Bomb group based at Roswell. It was the only atom bomb squadron in the world, and was a highly sensitive base. Marcel didn’t recognize the debris either, despite successfully completing courses on weather balloons and the radar targets sometimes attached to them. The debris was very odd – lightweight foil-like materials with toughened, memory-metal properties, dark, broken plastic-like material, and metallic I-beam structures with weird symbols molded into them. Lacking were electronic components, wood, or any fasteners – all usually associated with the construction of weather balloons. Marcel took an assortment of the debris material home to show his family. His son, Jesse Marcel Jr., whose testimony is set out in a new book entitled ‘The Roswell Legacy’, spent time examining the weird debris. His memory of this remarkable material has remained fresh for many years. He has been describing it on numerous television programmes, in magazine articles and at conferences for many years now. Lots of people have heard this story now, and have had the opportunity to weigh up the evidence. But for 30 years the story was dead. 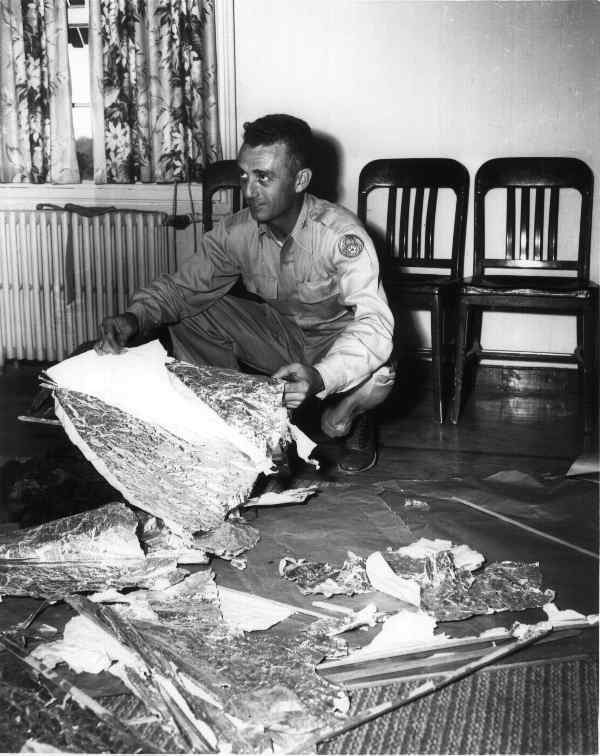 The debris was collected together and taken to the Roswell base, before being transferred under armed guard to Wright-Patterson Air Force Base. In the meanwhile, the initial public announcement by the Roswell base that a crashed flying saucer had been recovered had reversed. Major Marcel himself was photographed with a smashed-up weather balloon, which was not the desert debris he had first seen on Mac Brazel’s ranch just days before. A successful cover-up was under way, which even the U.S. Government now admits to. The question remains, after 60 years: What was being covered up? If you listen to the eye-witnesses, it becomes clear that they came across something truly bizarre. If you listen to the official explanation for the debris, it is alleged that they were utterly mistaken. The government and military have insisted for most of those intervening years that nothing was found out there except a weather balloon, albeit classified, and that the men running the world’s only nuclear bomb group of the time were silly klutzes with overactive imaginations. The Air Force published a 213-page document back in 1997, optimistically entitled ‘The Roswell Report: Case Closed’. In my opinion, it failed to close the case, notably because its attempt to favorably compare the debris reported from Roswell with the material used to construct a classified weather balloon, called Mogul, just doesn’t stand up to scrutiny. Today, the protagonists of this famous case are as far apart as ever, entrenched in the certainty that the other side is grossly mistaken, even foolishly naive. If you put Roswell in the dock, and presented the testimony supplied by the actual witnesses at the time, then I am quite sure that any jury would throw the government’s case out on its ear. There is no way that the debis material, as described by Dr. Jesse Marcel Jr., was from a 1940s weather balloon, no matter how classified. The military were seen to go to some considerable lengths to mop up all the evidence of this exotic material, and shut the story down. They managed this successfully for 30 years, until the inevitable began to happen: the witnesses themselves retired, relaxed, and began to talk about it. Now the story is fading into history. Indeed, my eldest son recently learned about Roswell in his secondary school history class. The witnesses have mostly passed on, with 72-year old Jesse Marcel Jr. the main exception. The trail is 60-years cold. But what remains is the remarkable testimony of the many, many witnesses, and the fact that for a short while the world’s only nuclear bomb group publicly disclosed its discovery of a crashed flying saucer. It was no coincidence that this object was found near Roswell, although the cause of the crash remains a mystery (a lightning strike?). There were undoubtedly excellent reasons why the government saw fit to cover this all up in the 1940s. But do those reasons really still apply today? Personally, I think the cover-up is a self-perpetuating operation which has become lost in its own labyrinth of secrecy. Jesse Marcel Jr. agrees, likening it to that famous last scene in Raiders of the Lost Ark when the museum official wheels the crate containing the Ark of the Covenant into a massive warehouse full of thousands of other wooden crates. ~ by andylloyd on October 30, 2008. It is interesting to note how Roswell has merged into our popular consciousness. What was a sensational proposition when Stanton Freidman first broke the case wide open now has become almost a cliche. Just as the majority of patriotic Americans accept the fact that Oswald probably didn’t act alone, the myster of Roswell is something that most people no longer see as impossible. Years from now, while we lament the “cold trail” of evidence and passed-on witnesses, we’ll be indebted to those researchers who were there at the forefront–interviewing, collecting debris, photos and written corroboration…the Ryan & Bob Woods, Freidmans and Col. Corso and more, pioneer historians who risked it all. Hopefully, they’ll have a place in our great grandchildren’s history books.